Hygiene is as important to the workplace as the equipment needed to get work done. And why not, when working in a hygienic environment means less work days lost to illness and an all round happier atmosphere? We at Alsco have noted that many companies have made a major effort to increase their hygiene levels, especially in the restroom. But, more than just toilet paper and loo bleach is needed to accomplish this. In fact, it comes down to providing the right facilities, and two principal types of facilities in particular: practical and design. 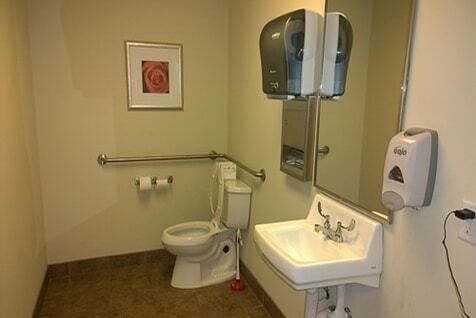 Practical facilities relate to the hygiene items that are provided, while design relates to how the restroom is set up. We’ve put together a brief guide to the kinds of things that your workplace restroom will need in order to maximise hygiene levels. Soap is the essential cleaning agent on hands, but the old-style bar of soap is not the best option. These tend to gather dirt on their surface, and while this does not mean cross-contamination takes place (bacteria is washed away with the lather), it doesn’t look hygienic so workers tend not to like it .Far better is soap in either liquid, foam or spray forms, made available in hand soap dispensers. These dispensers keep the actual soap away from any chance of contamination, while the push-button release mechanism means minimal contamination. There are a three methods of drying hands in the workplace restroom: cloth roller towels, electric hand dryers, and disposable paper towels. But not all of them are hygienic. Electric hand dryers are certainly effective in getting hands dry, but studies have shown bacteria levels actually increase by up to 194% on finger pads and 254% on palms. Modern jet air dryers, meanwhile, can spread contamination a distance of up to 2 metres . Disposable paper towels are a much more hygienic option, with bacteria reduced by 76% on finger pads and 77% on palms . But perhaps most crucially, being disposable makes the risk of contamination negligible – as long as the bins are covered properly. The cloth roller towel is highly effective too. Since cloth towel dispensers are closed, the used section of a roller towel is out of reach, reducing contamination dramatically. A study in 2007 found that with cotton roller towels, bacterial levels fell by 85% on the hands. The hand sanitiser is a valuable addition to efforts to keep hygiene levels up, but it is important to note that they should be used in addition to soap and hand drying systThe reason is that sanitising sprays only kill the transient bacteria that sit on the surface of the skin. More threatening bacteria lie just under the surface and can be got at more effectively by soap. The design of the restroom can cover a wide area, from the type of doors used to provide access to the actual design of the practical facilities provided. For example, while a soap dispenser is ideal as an effective way for workers to clean their hands, having a hands-free soap dispenser drastically reduces the risk of contamination from the dispenser button. Similarly, an automatic flush on a toilet means there is no handle from which to be contaminated. But hygiene starts at the restroom threshold, which is why swing doors are ideal. The design is a walk-in entrance that uses dividers that block the view into the restroom, but needs no doors. Of course, cubicle doors need to be locked, but slide latches or push button locks are more hygienic than twist mechanism latches that need to be gripped. While getting the facilities right is important, restroom maintenance is crucial too. After all, anything that is not in 100% condition is not going to be as effective as it should be. Appointing a facility manager from your staff can help to keep everything shipshape. But, if your workplace is large enough, then it might be worth considering renting rather than buying practical facilities. Alsco provides restroom stock and maintenance management services as part of a rental program, meaning your staff can focus on their core role instead of worrying about washroom maintenance and hygiene. For more inquiries contact Alsco now, our friendly representatives are here to help you!